I would like to set the record straight about my relationship with Steven Patrick Morrissey. This piece might come across as something of a hatchet job. If so then I apologise for any offence caused to his fans or even to the man himself - who I'm sure will be reading this. When asked which artist they associate with me, many would say Morrissey. They would say that I collect his records, which is true. They would say that I look like him, which has never been my intention. They would say that I worship the ground that he walks on, which is certainly not true. I have in fact heard myself referred to as "Morrissey Steve" to distinguish me from the many other Steves in my social circle. I should start by saying that I am a great admirer of (most of) his recorded output. There is no question that the Smiths are one of the most important bands of my lifetime. They changed my music tastes forever when I first heard them in my teenage years. I return to their records more than any others in my collection. I can quote all of their lyrics, and often do as there is usually a line that seems pertinent to any situation in which I happen to find myself. Morrissey's solo work was never going to match the splendour of the Smiths and although I can't quote all of his recent words faultlessly, I have still collected and enjoyed his releases. For me, his solo career peaked relatively soon after the break-up of the Smiths. Nobody could fault his 1992 album "Your Arsenal". I also have a fondness for the singles released at that time, particularly 1991's "Pregnant For The Last Time", when his music first began to show traces of rockabilly. This was largely down to the backing band he had now put together. Guitarists Alain Whyte and Boz Boorer were the most proficient musicians he had worked with since Johnny Marr. They also looked great - but more on that later. After two more impressive albums in the late '90s, the quality of his work began to decline. I find a lot of his music from this century to be rather wishy-washy and I haven't committed many of the lyrics to memory. The latest album, "World Peace Is None Of Your Business", shows signs of a rejuvenation with the songs telling the interesting stories we would expect, in contrast to the lyrics about nothing much at all found on "Ringleader Of The Tormentors". Perhaps there is scope for a full review on these pages at a later date. But enjoying someone's music is very different from idolising them or wanting to be like them. While talking about the availability of Morrissey dolls, someone jokingly suggested that I might have a shrine dedicated to him. There are stereotypical fans, who go to every show on a tour, fight over scraps of his shirt and do indeed have shrines - I used to know someone like this. I don't consider myself to be in this category, I certainly hope I'm not anyway. More than anything, I have never referred to the man as "Moz". Morrissey fanatics, male and female, often attempt to copy his appearance. You might be surprised to learn that my hairstyle is not based on Morrissey's in particular. A 1950s rockabilly look does sit well with many of the bands in my collection, and a better example of someone who has influenced my style would be Alain Whyte. Look at his neatly-styled quiff in the video for "Glamorous Glue" above, then compare it with the hairstyle of the singer - I would say that a rockabilly look was never really what Morrissey was going for. One of the most bizarre questions I've ever been asked was nothing to do with hairstyles. A complete stranger, not considering that I might genuinely suffer from hearing loss, said to me, "Do you wear that hearing aid to look like Morrissey?" I can't remember my response but it probably wasn't polite. Trivial matters of fashion aside, the main reason that friends associate me with Morrissey is probably that he is such a high-profile artist. Those who follow me on social media will know that if I had a shrine to anyone then it's more likely to be Kristin Hersh, Michael Gira or Amanda Palmer. None of these get much news coverage, so people focus on my interest in the one artist they know something about. Unfortunately his high profile is often for the wrong reasons and I don't want people to assume that I agree with some of his outrageous statements. A friend, who I hoped would know better, said that he thought that Morrissey was the person who had the most influence on my life. I was quick to point out that there are many aspects of Morrissey's character that I strive to avoid. It's fair to say that he's now known more for being outspoken than for his music. You could argue that everyone should stand up for their principles, but in Morrissey's case the line between principles and blatant attention-seeking is becoming increasingly blurred. Let's not waste time discussing all of his controversial quotes, but just look at the top of this page for an example of one of his outbursts that would embarrass any sane member of his fanbase. This is why I don't want people to think that he has any influence over my life. In recent years, he's become notorious for scrapping gigs and entire tours. I was saddened when the news broke about his serious illness, so obviously he can be forgiven for any cancellations due to health problems. But abandoning a gig at the last minute due to his own petty niggles with the venue or audience shows a disregard for the fans who already have tickets. I respect his decision not to eat meat and he is entitled to promote this viewpoint, but trying to enforce it upon others is another thing entirely. My vegetarian friends are realistic enough to accept that some people choose to eat meat. 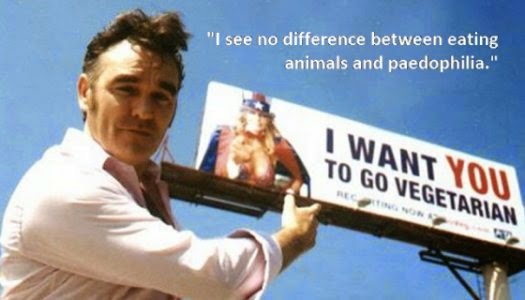 Come on, Moz, what makes you any different? He's currently in the news for demanding that a venue stops selling meat if his performance there is to go ahead. Tantrums like this have caused even the most fervent fans to say that he's a bit of a twit. I deliberated for a long time before deciding to buy a ticket for his forthcoming tour. At first I was reluctant due to the high cost, the size of the venue meaning it will be difficult to get a good view, but mainly the risk of the show being cancelled. What finally settled it for me was the thought that this might be the last time that I get to see him. Not so much a morbid prediction based on his current state of health, just that he might retire from touring due to his dissatisfaction with humanity in general. Assuming the show does go ahead, I'm sure I won't regret my decision. So, I hope that has cleared a few things up. Morrissey and I have had our ups and downs but we are still friends. Nothing more.